$41 Billion In Gift Cards Unclaimed Since 2005 : The Two-Way They're enormously popular — an estimated $27.8 billion worth have been given this holiday season. But many also never get fully used. What to do? Swap them. Regift them. Invest them. Or, perhaps, give them to charity. You may have given one — or two, or three. You may have gotten one — or two, or three. Now you may be wondering what to do with them (more on that in moment). They're the presents that show up in Christmas stockings all across America. The go-to gifts for aunts and uncles trying to please those finicky teenaged nieces and nephews. The tokens of affection that may say "I got this on the way over here." And, also, the gifts that sometimes never get used. 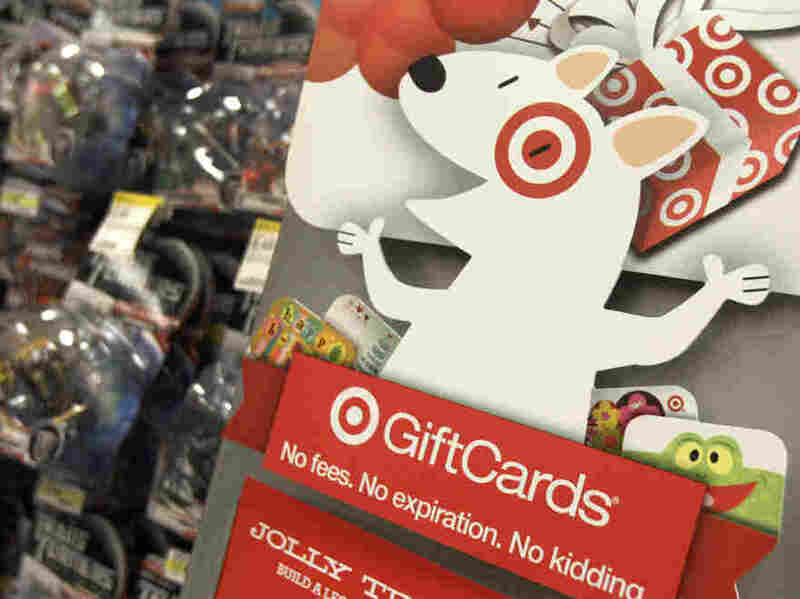 Since 2005, analyst Brian Riley of the TowerGroup research firm estimates, about $41 billion worth of the money on gift cards has gone unclaimed. That's such a huge figure it was Saturday's "number of the week" at The Wall Street Journal's Real Time Economics blog. So how do you avoid falling into that trap? The simple answer, of course, is to go out and use that card. Hopefully, it's one that can be applied to things you like or need. But let's say it's a card you don't think you'll ever use. Forbes says one way to get around the problem is by reselling. Plastic Jungle, it reports, is among the online outfits that will pay 80 percent or more of many cards' face values. The Journal points to that site two others that buy cards: GiftCardRescue.com and CardPool.com. Or, says MarketWatch.com's Consumer Confidential column, there's also a way to invest the money on a card: "GoalMine.com is an investment site that allows you to invest in a mutual fund for as little as $25 (the total expense ratios for the funds you can purchase through GoalMine currently are about 1.12% to 1.4%). Through January you can trade the market value of a gift card, as determined by its partner PlasticJungle, to your GoalMine account. As a bonus, GoalMine will redeem your first gift card for 150% of its value, which is applied to a GoalMine mutual fund or savings account." Of course, you could also do some "regifting" — pass that card along to someone else in the family who has a birthday coming up. Kind of cheesy, but an option. Or, there's always the altruistic route: Donate the card or an amount left on it to a charity. Call your favorite to see if it will take the card. Other ideas? Please share them in the comments thread. By the way, the National Retail Federation estimates that $27.8 billion worth of gift cards have been given this holiday season. In general, as USA Today says, "retailers can't count gift card sales as income until they are redeemed." So when can a company declare its revenue from unused gift-cards as income? The Journal says there "are no hard-and-fast rules. ... The Securities and Exchange Commission allows companies to take unused gift-card money as income once they can reasonably say the card won't be redeemed, but there's no set time limit. Best Buy, for example, sets that level at about two years. ... But some states don't allow companies to keep unused gift-card cash. They demand that companies give the money to the state after a certain period of time to add to unclaimed-funds accounts." According to the Journal, in 2008 the state of New York "collected $9.6 million in unredeemed gift cards and returned around $2,150 to the rightful owners."